Small to medium size, oblong, bright red skin. Sweet, spicy, firm, brown flesh, superb flavor-the choice of connoisseurs. Astringent until ripe. Good pollenizer for Coffeecake™ (Nishimura Wase). 200 hours. Self-fruitful. Unique spicy-sweet flavor that instantly evokes images of cinnamon pastry, hot coffee and morning sunshine. Coffeecake™ ripens about the same time as Chocolate and about three weeks to one month earlier than Fuyu. 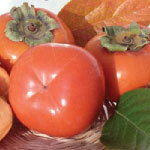 Coffeecake™ Persimmon is non-astringent and can be eaten while still firm. Hardy, attractive tree, practically free of pests and disease. Estimated chilling requirement: 200 hours or less. Another persimmon variety required as a pollinizer. Gosho or Chocolate are the best pollenizers for Coffeecake™. Medium size, flat shape, still hard when ripe, non-astringent. Cool or hot climate. Hardy, attractive tree, practically pest free. Fall harvest. 200 hours. Self-fruitful. Large, deep orange-red, acorn-shaped. Hot summer required to mature the fruit. Sweet, flavorful, astringent til soft-ripe. Mature fruit can be frozen and thawed to ripen. Productive, ornamental. 200 hours. Self-fruitful.